Fetch is an important factor in the formation, size and power of waves. Despite its importance fetch is a very simple thing. In the most straightforward way, fetch is just the maximum length of open water over which the wind can blow. Almost all of us have noticed that when the wind blows over a calm pond or lake we will see ripples on the water’s surface. Ripples are tiny waves and show the wind is at work. The work being done by the wind is actually called frictional drag, and is a transfer of energy from the wind to the water. Just as you see ripples on a drink or a bowl of soup when you blow on it, the wind creates ripples on the surface of the sea when it blows over that. Generally, (ignoring dead calm and very, very silly high speeds), the amount of energy transferred from the wind to the water will increase according to the length of time the wind is able to blow over it. More energy will be transferred if the wind can blow over the water for a long time than will be transferred if the wind can only blow over it for a short time. The force of the wind is also a factor in determining the size and nature of waves. You can read more about the types of sea produced by different wind speeds on the Beaufort Scale page. So, what determines how long the wind can blow, uninterrupted, over a body of water? The answer is very simple – it’s the length of the water between one obstacle and the next one. That length of open water over which the wind can blow unobstructed is called the Fetch. For a lake it’s one shore to the opposite one, and for a sea or ocean it’s exactly the same idea, but obviously with greater distances. A very short fetch, such as the width of a small lake, just isn’t large enough for the wind to transfer enough energy to the water to create large waves. You don’t get 10m high waves on a 50m wide lake, regardless of how deep it may be! Where the wind blows over the water for a large distance, a long fetch, larger waves may be created. It is very important to remember that fetch is the maximum length of open water over which the wind can blow unobstructed. Waves with the highest energy levels will result from a combination of a long fetch and a consistent dominant wind blowing in the same direction. So, in simple terms, the bigger the fetch, the bigger the wave. In the United Kingdom, the south western coast (for example, Lands End in Cornwall) is exposed to the Atlantic Ocean, with a potential fetch of humdreds of kilometers, so some waves could theoretically have their origins just off the South American coast. At the opposite end of the southern coast, around Dover in Kent, the fetch that is a mere 40km or so from the northern coast of France. Consequently, the energy and power of the waves hitting the south western coast are likely to be much higher than those of waves hitting the South Eastern coast. 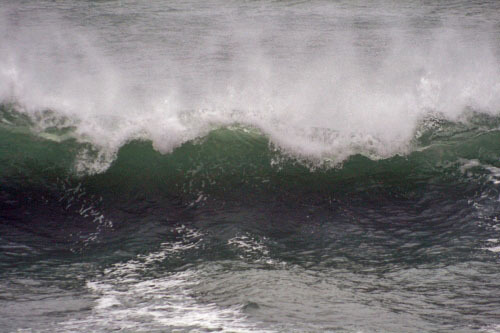 The wave photographed here was approaching the Cornish coast and was about 3m high.